The Best Bohemian Fashion blogs from thousands of top Bohemian Fashion blogs in our index using search and social metrics. Data will be refreshed once a week. 2.44 Cherry Diva - Fashion, jewellery and lifestyle blog. Bohemian Fashion newsletter is a comprehensive summary of the day's most important blog posts and news articles from the best Bohemian Fashion websites on the web, and delivered to your email inbox each morning. To subscribe, simply provide us with your email address. Mountain View, CA About Blog Comprehensive up-to-date news coverage about Bohemian fashion aggregated from sources all over the world by Google News. Facebook fans n/a. Twitter followers 212,761. Gold Coast, Queensland About Blog Inspired by their bohemian lifestyle, travels around the world experiencing different cultures and places, and an ingrained love of the ocean, Alex and Ryan started out creating collections of bohemian leather bags, wallets, shoes and accessories. Facebook fans 42,065. Twitter followers 212. About Blog We want to share with you what inspires us! From bloggers to brands and even just day to day living experiences. Facebook fans 106,000. Twitter followers 1,426. Western Australia About Blog This is a loving space for all to share, inspire and be inspired. A place for the magic makers, the dreamers and conjurers, the wild at heart, the love makers, the freedom seekers, the light workers, to all those who long to express their inner worlds through creativity and love. Within lies a gypsy soul and a loving light that shines right from my heart to yours. Facebook fans 38,759. Twitter followers 1,040. About Blog Lovestitch is women’s Bohemian clothes & affordable California style sweaters, dresses, skirts, jackets, scarves, rompers, boho bags and more! Facebook fans 5,718. Twitter followers 282. Livermore, CA About Blog Indie Women's Clothing, Fashion Boho Boutique. Shop gypsy boho stylish clothes. Fashion maxi dresses, boho jewelry, women's free spirited accessories, trendy style. Canadian boutique inexpensive tops scarves. Facebook fans 101,650. Twitter followers 1,132. Facebook fans 3,865. Twitter followers n/a. Sunset Beach // Bali About Blog Cleobella's handcrafted clothing, bags, jewelry and accessories are each individually made, creating sustainable incomes for artisans and families in Bali. Facebook fans 18,122. Twitter followers 1,376. About Blog The Freedom State was created with the wild spirit, the bohemian wonderer, the coastal dweller style in mind. Follow this blog to get a weekly dose of boho inspiration from our online store from other creatives, our labels and images that inspire us. About Blog Modern Bohemian Luxe Boutique. Diverse selection of designer clothing for women of all ages and body shapes. Facebook fans 26,262. Twitter followers n/a. LAX-ARN-CPT-LHR-TXL About Blog I write about fashion, beautiful environment, travel, shopping, my style, and things that I get inspired by. Facebook fans 1,886. Twitter followers 25. Del Mar, CA About Blog Shop the latest in bohemian fashion for women at the Van De Vort online boutique: boho dresses, jumpsuits, rompers, jewelry, lingerie, bathing suits and more. Facebook fans 4,075. Twitter followers 288. AUSTRALIA About Blog KiVARI is an Australian Boho-Luxe Fashion Label that caters to women full of adventure, travel and discovery. Quality leather, clothing, bags, and wallets. Facebook fans 19,221. Twitter followers 43. California About Blog Eva is an industry stylist, LA signed model, Fashion student, Designer, and creative director of this blog as well as an Instagram influencer. She is affiliated with LikeToKnowit & Reward Style as well. Facebook fans 382. Twitter followers 1,810. Florida About Blog A bohemian fashion blog, where you will find the most beautiful things related to boho fashion, hippie chicks and gypsy souls. Facebook fans 2,899. Twitter followers 754. Amsterdam, The Netherlands About Blog I am a Boho girl, born and raised in Amsterdam. I love the hippie Ibiza style. Take a look at my blog for fashion, travel and beauty inspiration! Facebook fans 18,120. Twitter followers 179. Chicago, IL About Blog DIY Lifestyle Blog by Allison B. Cooling. She is a a graphic designer. Her blog is devoted to DIY-ing jewelry using all types of techniques and materials. Occasionally, she also post tutorials for accessory DIYs, nail design DIYs, recipes, and art inspirations. Facebook fans 532. Twitter followers 115. Los Angeles, CA About Blog Bohemian by the Bay is a fashion and lifestyle blog dedicated to providing daily sources of creative inspiration. The mission of the blog remains the same throughout it’s ever-evolving state: to remain accessible, encourage readers to live creatively, and inspire them to break the norm. Los Angeles About Blog Lovestrength is a Bohemian vintage accessories and belt line, featuring a chic line of vintage belts, cuffs, and other accessories worn by celebrities. Facebook fans 1,270. Twitter followers 217. About Blog Modest Fashion Blog by Rachelle Yadegar. Fashion designer, stylist, and blogger Rachelle has had a vast amount of professional experience in the fashion world. Let’s just say that this chic chick is in the right pair of heels, and on her way to conquering the world! Facebook fans 1,826. Twitter followers 1,818. About Blog Fashion and Lifestyle Blog by Suzie. Her style can be explained as a modern day hippie style. Live and Die in LA About Blog A fashion & interior design blog written by Los Angeles based interior designer Aimee Song, featuring daily fashion photos, design inspiration, and more. Facebook fans 903,199. Twitter followers 68,564. Byron Bay About Blog Spell & The Gypsy Collective is a modern-bohemian fashion brand, inspired by far-off places, vintage treasures and childhood memories. The label is known worldwide for its gypsy-inspired creations. Facebook fans 209,209. Twitter followers 7,212. SEA About Blog Stardust Bohemian is the Brand Blog of fashion artist Sera Brand. Sera has had mentor ship in the field of Fashion Design and Styling from knowledgeable mentors and teachers. She is self taught when it comes to bohemian fashion styling and creating her personal designs. Facebook fans 1,141. Twitter followers 167. South Carolina, USA About Blog Boho Style File is a lifestyle & fashion blog where Jenny shares her love and passion for style, beauty and life. Facebook fans 1,966. Twitter followers 1,081. Miami, Florida About Blog There are some cray outfits on this blog that are sometimes hippie, sometimes street. But, Afroza considered those looks “Hippie Street Chic!” Stylista comes from her passion of styling. She worked as a freelance fashion stylist for Miami Modeling Agencies. So, for the blog she combined the two things she love and created Chic Stylista. Facebook fans 489. Twitter followers 14,270. About Blog Sara's fashion style is a mix of indie, boho, and grunge. She is a fashion and beauty blogger, a dreamer, an artist, an animal lover & animal advocate, a professional make-up artist, a musician, an esthetician, and a woodland creature. Facebook fans 341. Twitter followers n/a. Tel Aviv About Blog Bohemian Archives is all about the bohemian fashion and style. Karen Or is a Israeli fashion blogger and street style photographer from Tel Aviv. Facebook fans 3,385. Twitter followers 20. California About Blog Stone Cold Fox, a clothing label Designed and made in Los Angeles, that takes inspiration from the delicacy of vintage clothing and seeks to make it fresh again. Facebook fans 45,312. Twitter followers 7,419. Facebook fans 20,085. Twitter followers 53.
nashville About Blog Alyssa Kontos is a fashion-obsessed girl who loves nature, animals, and all things bohemian. This blog is dedicated primarily to her personal style. Facebook fans 267. Twitter followers 163. Manila, Philippines About Blog Lyndsay Picardal is a 21-yr old amateur blogger and model based in Manila. She’s a graduate of Mass Communication at Far Eastern University. She likes to write creative articles with regards to beauty, lifestyle and trends related to boho style. About Blog Boho-chic is back in style and Bohemian FashiONline jewelries & co shop, blog and social news its now on the market. Facebook fans 90. Twitter followers 23. Montreal About Blog The Bohemian Boudoir is an aspiring Fashion and Beauty blog. Facebook fans 45. Twitter followers 33. About Blog A blog collection of Bohemian looks and style inspiration. Dublin, CA About Blog Three Bird Nest is known for bohemian style, outfit ideas amazing style. Three Bird Nest's YouTube Channel! We're a team of free-spirited fashion lovers that will offer beauty, fashion styling tips. Facebook fans 382,012. Twitter followers 3,695. Los Angeles, CA About Blog The first ready-to-wear collection was designed in their hometown of Jackson, WY and has since evolved into a true lifestyle brand with the additions of their lingerie and knitwear collections. Facebook fans 95,507. Twitter followers 24,408. Gold Coast, Queensland About Blog Beautiful boho fashion clothing, accessories and home decor for the free spirited. Shop bohemian labels such as Spell Designs, Arnhem, Auguste, Amuse Society. Facebook fans 20,080. Twitter followers 53. About Blog My name is Jessica Bubb and I’m a freelance photographer based out of Upstate NY. Having a camera in my hand since I was young, I feel it’s what I was born to do. My love for wandering, the wilderness, and creativity strongly shape my concepts. My passion is creating artistic imagery through a lens. About Blog Simple wedding dresses handmade in Los Angeles for the romantic bohemian bride. Our dresses are rustic with an easy effortless relaxed vibe. Facebook fans 3,426. Twitter followers n/a. 44. Cherry Diva - Fashion, jewellery and lifestyle blog. Birmingham, England About Blog Cherry Diva is an online treasure trove of bohemian and statement jewellery from the UK. Discover our sterling silver rings, midi rings, pendants & more. Facebook fans 33,470. Twitter followers 24,450. About Blog Bohemian jewelry from all around the world including statement necklaces,stackable rings,turquoise rings,boho jewelry and fashion jewelry. The jewelry incorporates precious stones like coral,lapis,aqeeq stone and turquoise stone. Facebook fans 10,994. Twitter followers 261. Toronto, Ontario About Blog Online destination for unique & contemporary Mexican designer jewelry. Dive into a world of timeless elegance, feminine flair, and statement pieces. Facebook fans 561. Twitter followers 52. Byron Bay About Blog Amilita clothing is designed for the modern Gypset and is brought to you from Byron Bay. With a love of fashion, art and all things vintage, bespoke and bohemian. Facebook fans 3,684. Twitter followers 110. Facebook fans 3,305. Twitter followers 2,631. About Blog For all bohemian, fashionable kitties, Boho kitty based in Sofia. europa About Blog Bohemian fashion and lifestyle blog. Facebook fans 1. Twitter followers 26. About Blog Savanna Petersen is currently a junior Marketing student at the University of Northern Iowa. Her style is bohemian but somewhat toned down. Facebook fans n/a. Twitter followers 797. About Blog Blog on Bohemian fashion and style. About Blog Blithe and Bliss, a handmade bohemian lifestyle- taking vintage and upcycled fabrics and turning them into handmade boho chic gypsy festival fashion kimonos, dresses, tops and slow movement fashions- sharing creative process, retro vintage bohemian lifestyle, and bringing creative locals together with the Creative and Creators Club of Ventura County and Conejo Vallley. Kampala, Uganda About Blog Twenty something, Ugandan Fashion Blogger. Happiness is my end goal. 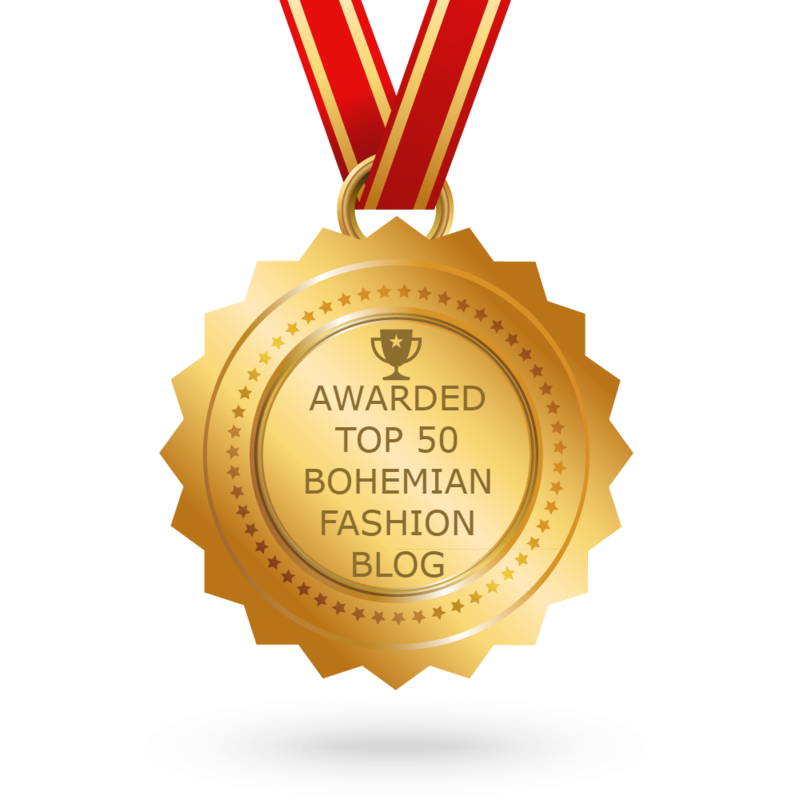 CONGRATULATIONS to every blogger that has made this Top Bohemian Fashion blogs list! This is the most comprehensive list of best Bohemian Fashion blogs on the internet and I’m honoured to have you as part of this! I personally give you a high-five and want to thank you for your contribution to this world.